Carole Boston Weatherford has written numerous award-winning books for children, including Becoming Billie Holiday, illustrated by Floyd Cooper, which won a Coretta Scott King Author Award Honor, and the Caldecott Honor-winning Moses: When Harriet Tubman Led Her People to Freedom, illustrated by Kadir Nelson, which also won an NAACP Image Award. Carole Boston Weatherford lives in North Carolina. Ekua Holmes is a fine artist whose work explores themes of family, relationships, hope, and faith. In 2013 she was named to the Boston Arts Commission, which oversees public art projects on city property. Voice of Freedom is her first picture book. Ekua Holmes lives in Boston. A welcome addition to civil rights literature for children ... Hamer's determination, perseverance, and unwavering resolve come through on every page. Holmes' quiltlike collage illustrations emphasize the importance Hamer placed on community among African-Americans. Young readers who open this book with just a vague notion of who Fannie Lou Hamer was will wonder no more after absorbing this striking portrait of the singer and activist. Bold, honest, informative, and unforgettable. 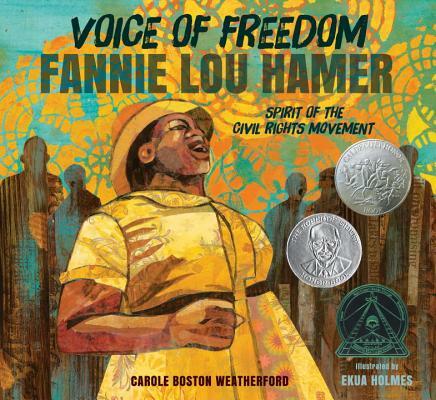 Caldecott Honor winner Weatherford (Moses: When Harriet Tubman Led Her People to Freedom, 2006) has rendered Hamer’s voice so precisely that it is like sitting at her knee as she tells her story. Holmes’ multimedia collages perfectly capture the essence of each poem. Like Hamer’s life, the illustrations are filled with light, texture, movement, and darkness. They are both abstract and realistic, brilliantly juxtaposing gentle floral motifs with protest placards and Fannie Lou Hamer’s face in bold relief. Ultimately, though this is Hamer’s story, it includes the collaborative struggles of others with whom she worked and fought for a different America. Bold, unapologetic, and beautiful. Told in the first person from Hamer’s own perspective, this lyrical text in verse emphasizes the activist’s perseverance and courage, as she let her booming voice be heard. Holmes’s beautiful, vibrant collage illustrations add detail and nuance, often depicting Hamer wearing yellow, which reflects her Sunflower County roots...Hamer’s heroic life story should be widely known, and this well-crafted work should find a place in most libraries. Artist Holmes, in her children’s literature debut, elevates an already excellent narrative with richly colored collage illustrations that layer meaning upon meaning with scraps of historical photos, newsprint, maps, musical scores, and more...This majestic biography offers a detailed, intelligible overview of Hamer’s life while never losing the thread of her motivations, fears, and heroic triumphs, and places the civil rights movement in personal, local, national, and international contexts. In a series of poems in this biography, Weatherford traces the life of Fannie Lou Hamer from her childhood as the youngest of 20 children of sharecroppers in Mississippi to her social and political activism...The poems feature particular events in Hamer’s life and their implications, which provide readers with memorable, heart-wrenching details. Consider this not only as an accessible biography but also as a piece for solo or duet performance. The combination of history, poetry, and brilliant watercolor illustrations makes this a picture book on the Civil Rights Movement that should not be missed. In a new children’s book, Roxbury painter and collage artist Ekua Holmes juxtaposes light and dark, flowers and protest signs to represent the life of Fannie Lou Hamer, civil-rights activist.